For Easter this year we bought Aleia a ride on Mercedes car and she absolutely loves it! We decided to upgrade her car for a 12 volt powered car with a remote control so hubby and I can control it. I have been researching on which car to get for months and decided with this one. I am extremely picky when it comes to picking out furniture for Aleia’s room and I couldn’t be more excited for this table and chairs for Aleia’s big girl room! Love how modern and stylish it is! 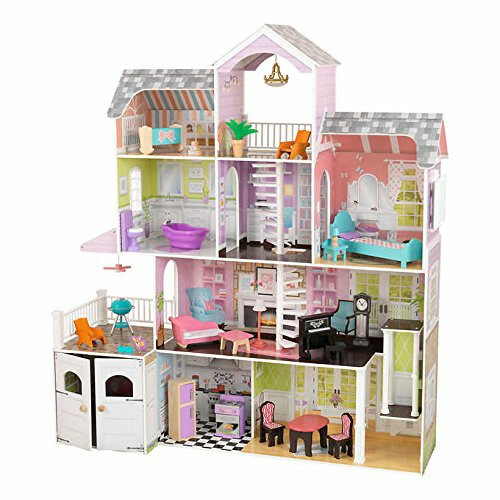 I have to admit I was super excited when Aleia started playing with dolls and Barbies because growing up I have wanted a giant doll house! So, ofcourse when it was time to choose Aleia’s Christmas present she just has to have this 5 ft doll house with a horse stable! Plus I really like a lot of the toys Kidcraft makes. Aleia is obsessed with the ocean and all things mermaid so this Mermaid tail blanket bag is perfect for movie nights! It also makes the perfect stocking stuffer. Aleia loves watching and doing everything I do thesedays, including getting ready in the morning and putting on make up so this is the perfect solution to my ruined lipsticks and missing eyeshadow palette problems! Prim + Pretties makes the cutest pretend make up for your little mini. Ofcourse my ocean baby had to have this beautiful Isla the Mermaid doll from Cuddle + Kind. Love this super soft and hand knit doll so much and how every doll sold on their site feeds many children! Definitely a must have for children of all ages! We are always out exploring and living on the West Coast we are always wearing our rain boots so Aleia needed these adorable soft pink boots with polka dots from London Littles. Aleia loves Tangled so this was a no-brainer! Aleia loves horses! I can’t wait until she opens this one! Our Generation makes the most beautiful dolls and horses! Aleia has been on her balance bike since she was 13 months old and it’s definitely time for an upgrade! We picked out a pink Strider Bike! Aleia’s starting dance class in January and we had to have this adorable Peony Leotard from Remie Girl! For Christmas Eve we always gift Aleia a new Christmas pjs and this year I picked out the cutest onesie from Little Blue House. I can’t wait for Aleia to open all her presents on Christmas morning!! *This post is sponsored by some of my favourite shops/brands. All thoughts and opinions are of my own. My kids would love it! Thx for the great ideas! All super cute! Such great ideas!